Treat other people how you want to be treated. This basic ethical principle, known as the Golden Rule, has been expressed by spiritual teachers from Confucius to Buddha, Jesus and others. For Mike Ellerkamp, it’s “the simple little rule,” the rediscovery of which has the potential to connect us to the Divine. Ellerkamp first presents a brief spiritual memoir, describing his journey through various philosophies. He then speaks of his revelation that the Golden Rule is a universal principle grounded in both the imperatives of biological evolution and the promptings of a Supreme Consciousness. All of us have the potential to connect with this universal Truth, he posits. The author then describes an ethic based on a set of ancient virtues he calls “principles”—including wisdom, justice, moderation, courage and discipline—and delivers a series of meditations on each, peppering his presentation with personal anecdotes often derived from the author’s military experience. He also includes questions for personal reflection. 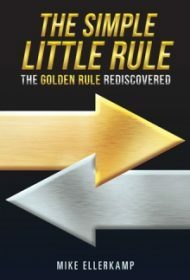 The book’s final sections address how to apply these virtues, and the Golden Rule they embody, in everyday life. The narrative is written in a conversational tone and reads like a kindly sermon by a non-denominational minister. Its broadmindedness and equanimity are attractive, but the author often trades in platitudes or vague generalities. For example, in the chapter “Finding a Higher Purpose,” he writes that “Somehow, we must, through personal search and acquisition of these truths, let go of greed, fear, hatred, prejudice, and all the other dysfunctional traits that impede our progress.” But how are we to discard these “dysfunctional traits”? Unfortunately, the “how to” is missing. The book presents age-old advice, but without offering a more compelling or convincing synthesis of this material than past teachers. As such, it’s unlikely to convince the unconverted, or excite believers.